Life is coming At us each and every day. Let us receive God’s grace so that we can be determined to stay on the path of rock-solid living in this quicksand world. Let us really listen to Christ, and let His words take root in our hearts and grow from within us. Let us abide in Him, and He in us, so that we will really bear fruit and glorify God. Let us watch out and pay attention to people who want us to follow them. Let us pay attention to the fruit they bear as well as the teachings they teach. If their philosophy is from the world system(s) instead of the kingdom of God, let us not follow them. Let us choose to go through the narrow gate on a solid foundational path for true living. Let us avoid at all cost the quicksand path of the broad way that leads ultimately to death and our demise. Let us be on guard for the ultimate terrorist, Satan. Jesus has defeated him, and we can overcome his lies and deception. Let us hold fast to the ancient belief that treating others the way we want to be treated is a life-changing Golden Rule, and it is far better than the mire and muck of political correctness. Let us ask God, seek God, and knock on heaven’s door until God hears us. This is a great way to relate to the Almighty. AND let us BE QUIET and listen while we are connecting like this with God. Let us always remember that there are indeed absolutes in this world, and making fair judgments—judgments by which we would judge our own selves—is a Godsolid, rock-solid way of determining the right and wrong of life. Worry-free living is attainable. So let us take the steps that Jesus has provided to have more peace. Let us do some rock-solid banking that has eternal value, send some of those treasures ahead toward our heavenly home: feed the hungry, clothe the naked, visit the sick, visit the imprisoned, and give drink to the thirsty. Let Jesus fix our spiritual eyes in order that we can see God at work all around us and see His kingdom at work within us. Everybody serves somebody sometimes, and that includes us. Let us choose wisely whom or what we serve. As for me and my house, we will serve the Lord. Let us volunteer for God’s “secret service,” which includes secret giving, praying, and fasting. As we keep it simple, saint (KISS), God will eternally bless us. Let us never forget the life-producing steppingstones of grace and truth. These actually do complete or fulfill the law and the prophets. Let us remember the five stumbling blocks to experiencing the liberating limits of the law, and may we allow God to work in us to transform them into life fulfilling stepping stones. s Shaking a little salt, shining a little light, and being God’s GPS demonstrates that we are definitely on God’s rock-solid path. As we journey through each stage of our life down through “Happy Valley,” let us walk on God’s blessed, happy stepping-stones. By God’s grace, let us practice what Jesus preached. If we really want a blessed, happy and eternal rock-solid life, let us follow Jesus’s stepping-stones as we walk the walk of life. It may not always be easy, but it will definitely be eternally rewarding. And no storm in life will ever blow us away. So let us experience Rock-Solid Living in a Quicksand World. 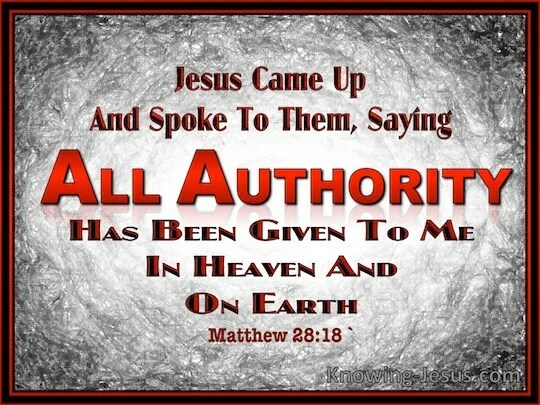 Jesus was once asked, by those who opposed him, where did He get the authority to say and do the things that He was saying and doing. When He was asked this question, He was unwilling to give them an answer. It is clear He spoke authoritatively as no one before Him. As some guards once explained why they could not arrest Him said, “No one ever spoke the way this man does.” (John 7:46) And they were correct; yet, once Jesus had conquered hell, death, the grave and even the Devil himself, He closed out His teachings with the words portrayed in the box above: “All authority in Heaven and on Earth has been given to me.” (Matthew 28:18) The teachings of “The Sermon on the Mount” are based on the Authority given to Jesus by God the Father via the power of The Holy Spirit. Some words were left out of this picture. He went on to tell His disciples, “Therefore, go and make disciples of all nations, baptizing them in the name of the Father and of the Son and of the Holy Spirit. (Matthew 28:19-20) And surely I am with you always, to the very end of the age. “ Therefore He also gave His authority to those Christ-Followers who would deny themselves, take up the cross and follow Him. He gave them to those who would dare be the light of the world, the city on a hill and the savory salt of the earth. I am almost certain there are those who will like what has been said in this book; yet, I am just as certain that there are those who will not like anything about the teachings frankly spoken on the pages of this script. Like those who opposed Jesus in His time, they will wonder what right I have to say these things. I would say to them, that as an American, I have the right to do so as expressed in the first amendment of The Constitution of The United States of America. But there is a greater authority than this. It is the authority passed down through the centuries to the women and men of God who seek to live by the grace of God, because of the power of God for the glory of God. It is the authority given to me, by the laying on of hands, at my ordination. In a nutshell, I share these teachings about Rock-Solid Living in a Quicksand World by the authority passed on to me by my Lord and Savior who is Jesus the Christ. I do sincerely hope that the reader has ears to hear what the Spirit is saying. Chaplain Al McGowen is a graduate of The University of Alabama and Memphis Theological Seminary. He married the love of his life and the former Vicki Jinks on May 7, 1971. As of the writing of this book, they have journeyed together for almost 45 years. He grew up during the 1950s and 1960s in a little town outside of Birmingham, Alabama … New Castle. These were challenging times in the Birmingham area (as well as the USA.) Growing up in the south during these times gives him a unique perspective of our culture. Vicki and Al have three children and six grandchildren. Chaplain McGowen served in the U.S. Air Force as both an enlisted man and an officer, retiring as a Chaplain Lieutenant Colonel. He also retired as a United Methodist Clergy. Finally he retired from the Veterans Administration as a Palliative/Hospice Care and Mental Health Chaplain. His military career was served on active duty and in the reserves from 1970-2010 (except from 1976-1979.) Though he is a disabled Veteran, he does not claim to be a hero of any kind. He was glad to serve. His service in the military and VA acquaint him quite well with the workings of our pluralistic and rapidly declining culture. Chaplain McGowen believes there is real hope for individuals, families and our culture to recover, renew, revitalize and revive. He believes each of us truly can experience Rock-Solid Living in a Quicksand World, if we choose wisely which of the two paths set out before us. This book is a seed planted that will hopefully help resurrect us individually and collectively into new life. This book is dedicated to the Glory of the true and living God. It is written for the glory of the ONE who imparts His wonderful life transformational grace to all those who would bow their knees and confess from their hearts that Jesus is Lord to the glory of God the Father. It is further dedicated to the love of my life, Vicki Jinks McGowen, who has been and still is walking with me through the ups and downs of our journey together … for better, for worse, for richer, for poorer, in sickness and in health. It makes little difference if we lived in a shack, in interesting military housing in San Vito, Italy or our present day home. She has always been here with me and for me even to this very day. Thank you Vicki for walking with me through these many years. Thank you for learning with me that life is an adventure.